Although Ohio has lost most of its' wetland habitats due to land development and other human interactions. 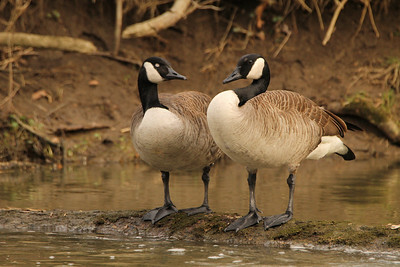 The remaining locations in southwest Ohio are ever abundant with water birds. Quite possibly the easiest to start photographing due to their larger size compared to songbirds. 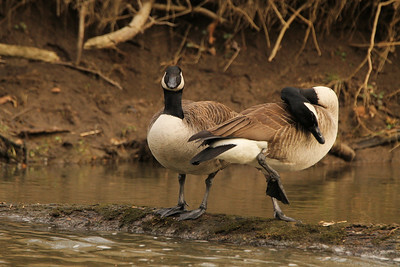 Waterfowl and shorebirds make for captivating subjects to observe and enjoy. 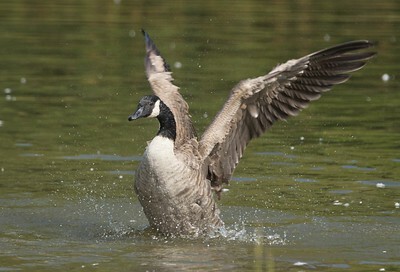 Twice a year a majority of these waterfowl migrate along a flight path down south and back up north again, southwest Ohio passes through the Mississippi Flyway. 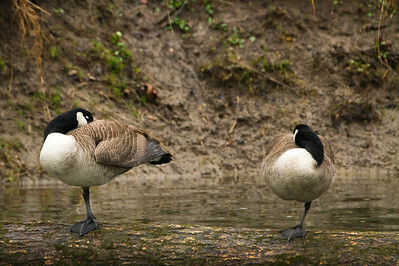 This gallery primarily involves ducks, geese, and swans. Narrows Reserve, Beavercreek Ohio © 2018 Ryan L. Taylor Photography. All Rights Reserved. Spring Valley Wildlife Area, Spring Valley, Ohio © 2018 Ryan L. Taylor Photography. All Rights Reserved. Philips Park, Beavercreek, Ohio © 2018 Ryan L. Taylor Photography. All Rights Reserved. 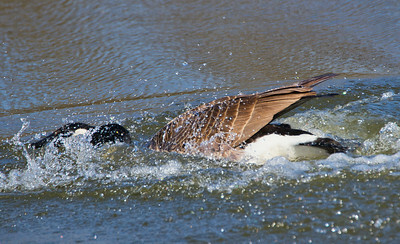 Philips Park, Beavercreek, Ohio This Canada Goose is presumably sunning to dry off its' feathers and wings after bathing the in the pond. 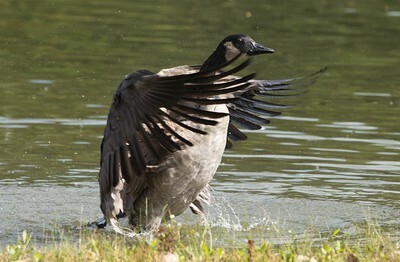 They will also rapidly flap their wings to shake off any remnants of water droplets. I liken this motion as if they were the conductors of an orchestra. © 2018 Ryan L. Taylor Photography. All Rights Reserved. Angels Pass Memorial Park, Beavercreek, Ohio While this isn't the first image I ever took, this is the oldest one on this site. It is perhaps the one that got me interested in wildlife photography when it landed me a little spot in the local newspaper. This is perhaps the first photo that truly got me interested in wildlife photography. Just a simple minimalist portrait taken during midday light in a local pond. © 2016 Ryan L. Taylor Photography. All Rights Reserved. Philips Park, Beavercreek, Ohio The pure moment of impact takes focus over whether the image should be sharp or not. Diving in from a landing. © 2018 Ryan L. Taylor Photography. All Rights Reserved. Spring Valley Wildlife Area, Spring Valley, Ohio "Love is like the wind, you can't see it but you can feel it." - Nicholas Sparks This was my very first trip to Spring Valley Wildlife Area last February. 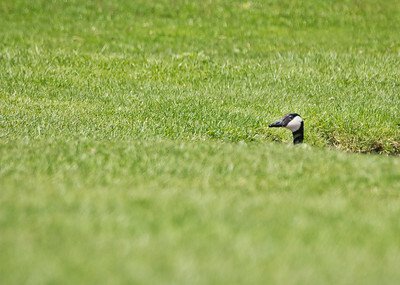 I was eagerly anticipating the multitude of waterfowl in the 150-acre lake and marsh. This is where I spotted my first sightings of several birds, including Mute Swan, American Coot, and Wood Duck. 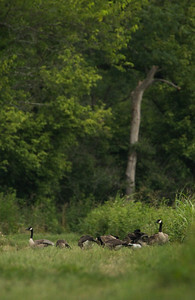 Mallards and a very large gaggle of these Canada Geese were present as expected. This made for a sunny and chilly day as I slowly but surely circled my way around the lake while observing the birdlife through my lens and binoculars. 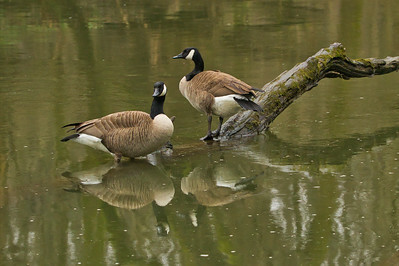 On the wooded side of the lake there was a clearing in the brush and these two geese were near the waters edge. 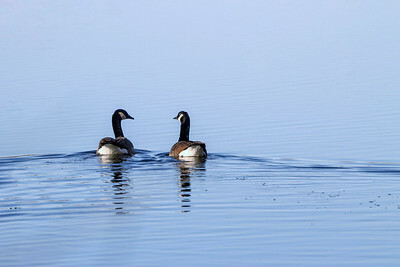 I was essentially spotted and they both slowly turned and went further out to the water. I managed to take off a handful of shots, this one being a keeper. 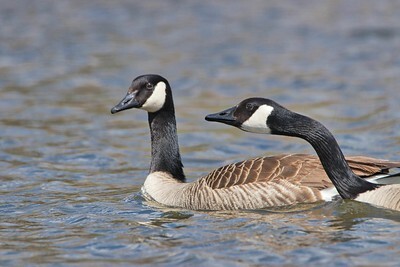 While most birds do not mate for life. There is a special bond created between mates where they move together such as in this image. If only they got a little closer and formed a heart with their heads and necks. Unfortunately that moment never came. © 2018 Ryan L. Taylor Photography. All Rights Reserved. Cemex Reserve, Fairborn, Ohio © 2018 Ryan L. Taylor Photography. All Rights Reserved. 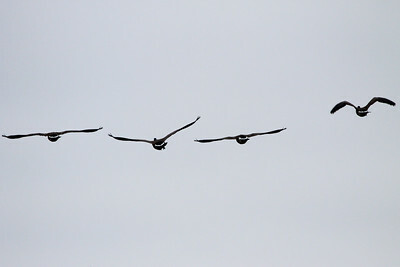 Fairborn Marsh, Fairborn, Ohio Viewing a flock of Canada Geese rise up together and hastily form their V-formation in flight is fascinating. © 2018 Ryan L. Taylor Photography. All Rights Reserved. Fairborn Marsh, Fairborn, Ohio I liken this image to the "O-H-I-O" that people typically do at Buckeye football games. The very subtle distance between the leftmost three and the the gap with the rightmost one breaks up the pattern a bit. © 2018 Ryan L. Taylor Photography. All Rights Reserved. Fairborn Community Park, Fairborn, Ohio I sat by a local pond for a better part of an hour. I was partially obscured by a tree and my telephoto lens and camera mounted to a tripod very low to the ground. The late morning sun was beating down leaving me sweating after hiking for miles since the misty and foggy morning. 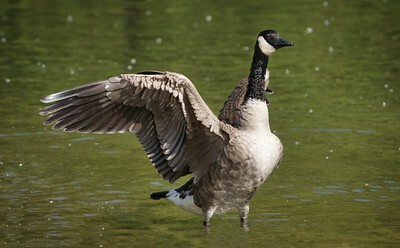 A gaggle of about 30 of these Canada Geese were congested to the side of the pond closer to me. 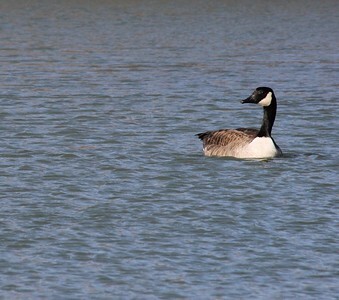 I situated the sun towards my left side and watched through binoculars as geese were bathing and in the nice and cool water. © 2018 Ryan L. Taylor Photography. All Rights Reserved. Fairborn Community Park, Fairborn, Ohio I sat by a local pond for a better part of an hour. I was partially obscured by a tree and my telephoto lens and camera mounted to a tripod very low to the ground. The late morning sun was beating down leaving me sweating after hiking for miles since the misty and foggy morning. 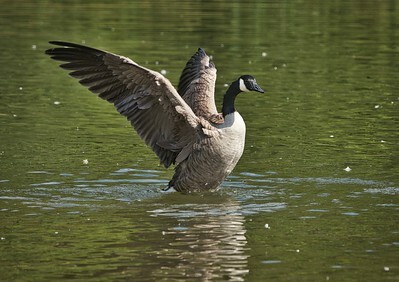 A gaggle of about 30 of these Canada Geese were congested to the side of the pond closer to me. 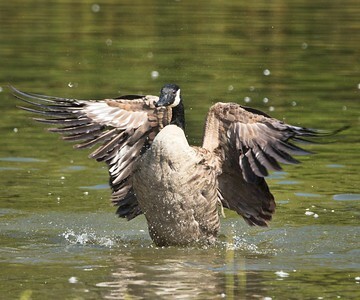 I watched through my binoculars as geese bathed while swinging their wings back and forth to dry off. © 2018 Ryan L. Taylor Photography. All Rights Reserved.